IRVINE, California, October 14, 2013 (ENS) – Collegiate teams from Austria, Las Vegas and Czech Republic took the top three spots in the U.S. Department of Energy Solar Decathlon 2013, a global competition to build the most energy-efficient solar-powered house. Team Austria, made up of students from the Vienna University of Technology, won top honors overall by designing, building, and operating the most cost-effective, energy-efficient and attractive solar-powered house. University of Nevada Las Vegas took second place, followed in third place by the team from Czech Republic, comprised of students from Czech Technical University. All the houses in the 2013 competition were built at the Orange County Great Park in Irvine, and every house produced more energy than it consumed. Nineteen collegiate teams competed in 10 contests over 10 days that gauged each house’s performance, livability and affordability. The teams performed everyday tasks, including cooking, laundry, and washing dishes, that tested the energy efficiency of their houses. The winner of the overall competition best blended affordability, consumer appeal, and design excellence with optimal energy production and maximum efficiency. Reflecting the quality of the Solar Decathlon 2013 houses, the winning teams’ final scores were the closest they have ever been since the beginning of the competition in 2002. Team Austria earned 951.9 points out of a possible 1,000 to win the competition, followed by University of Nevada Las Vegas with 947.6 points, and Czech Republic with 945.1 points. Contributing to their overall win, Team Austria performed well in the individual contests, finishing first in the Communications Contest, second in Market Appeal, and tied for first in the Hot Water Contest. Full competition results and details about the individual contests may be found at www.SolarDecathlon.gov. The results of the Engineering Contest also were announced Saturday with Team Ontario, which included students from Queen’s University, Carleton University and Algonquin College, taking first place by scoring 95 out of 100 possible points. Each competing house was evaluated by a group of engineers who determined which house best exemplifies excellence in energy-efficiency savings, creative design innovations, and the functionality and reliability of each system. Czech Republic claimed second place in the Engineering Contest with 94 points. A three-way tie for third place honored the University of Nevada Las Vegas, the University of North Carolina at Charlotte, and Team Austria all tied for third place with 93 points each. 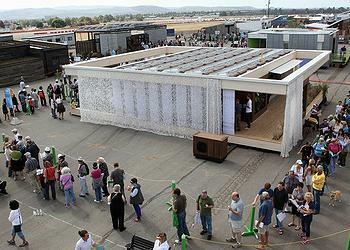 Full details on the contest results will be available at http://www.solardecathlon.gov/contest_engineering.html. Student teams in the 2013 competition spanned two continents, including teams from the United States, Canada, Austria, and the Czech Republic. 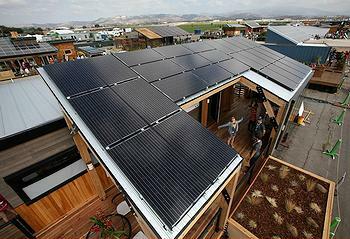 Since the first competition in 2002, the U.S. Department of Energy Solar Decathlon has provided unique training to approximately 17,000 students, preparing them to become the next generation of innovators and entrepreneurs in clean energy technology and efficient building design. The competition also shows consumers first-hand how to save money and energy with affordable clean energy products that are available today.